Warwick Avenue came into being in 1934, when Gambles, the builders, were building the Spinney Drive, Elms Drive, Cradock Drive, Beacon Avenue and Warwick Avenue estate. Spinney Drive was the first road to be built (1927) and Beacon Avenue was the last street (1930s). All of this area had previously been owned by John Davys Cradock from Quorn Court. Prior to the building of the 1960s ‘Warwick Avenue estate’, there were gates across Warwick Avenue, about where Sutton Close is now, and there was just a track through to Woodhouse Road. The area was basically fields, a caravan site, a refuse tip and a site where sand was extracted. The map is based on an Ordnance Survey map in 1965, and it has been overlaid with the current route of Warwick Avenue. The present 102 Warwick Avenue (as shown in the photograph), existed before Jelsons built the Warwick Avenue estate, and was previously called 12a Woodhouse Road, and was occupied by the Bayliss family who owned most of the land, including the Silverdale Caravan Site, shown in green. In 1961 the electoral roll records 86 adults living in caravans on this site. 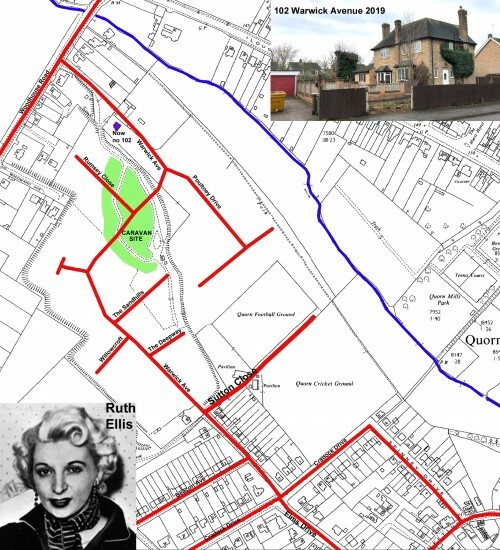 In about 1950, Ruth Ellis (Neilson as she was then), lived in a caravan here with her son Andy. Ruth was a glamorous blonde nightclub hostess, who, in a crime of passion shot dead her racing driver lover David Blakely in 1955. She was 28 years old when she was hanged a few months later, and was the last woman to be hanged in Britain. When in Quorn she had supported herself by working in nightclubs in Nottingham, but nobody seems to know how or why she came to be here. There are still people in the village today who remember playing with her son Andy at Quorn Primary School. Does anyone know why Warwick Avenue was so named? Missing information: Does anyone know why Warwick Avenue was so named?